We held Chris’ company Christmas party early December so we could have many employees attend. The party was held at The Pour Wine Bistro in Otsego. We arrived early so we could choose some of the wines for dinner. We wanted two reds and two whites. The first white was a Chardonnay. It was crisp and buttery. Since I am a fan of Chenin Blanc (I think South African ones are my favorite) I wanted to try this one. Aromatic, young-fruity with aromas of apple and melon. Dry, light-bodied with balanced acidity. Crisp apple flavors as I exhale with a medium finish. How much: $17 – $19 retail. Region/appellation: North Coast California from the Mangels Ranch. At the end of the night, there was an open bottle. We brought it home and I used my Vacu Vin to remove any air. I refrigerated till the next day. Maybe the wine was slightly cool than it should be. I just did not enjoy it as much as the night before. 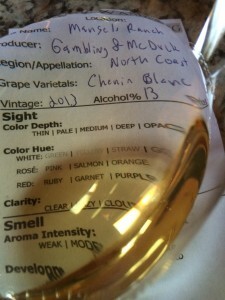 Maybe my palate was slightly flat from the other wines. 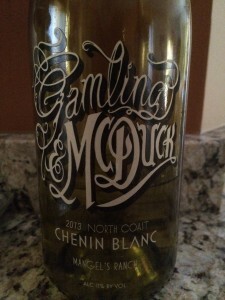 I rated the 2013 Gamling & McDuck Chenin Blanc two glasses.